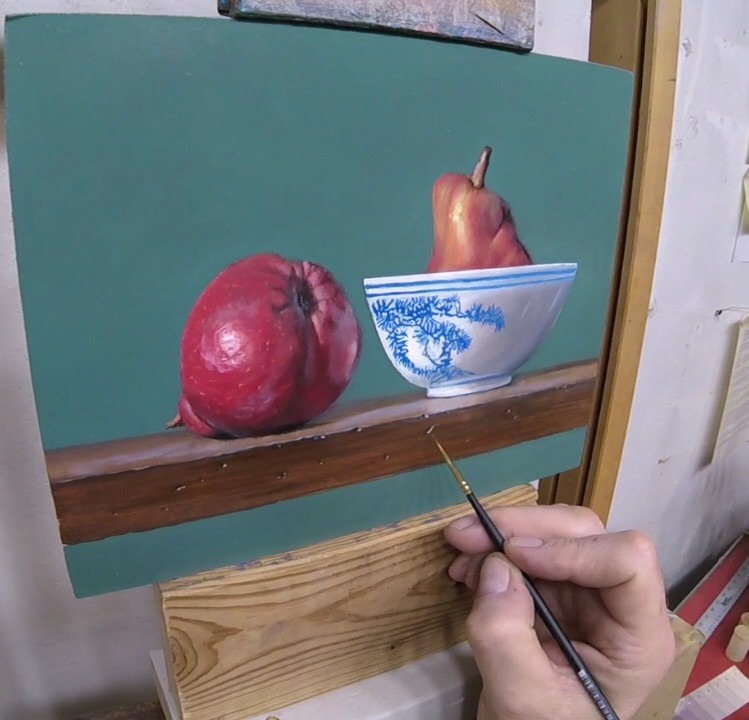 Pears painting demonstration, a Still life oil painting demonstration of red pears using a special self leveling paint mixture. 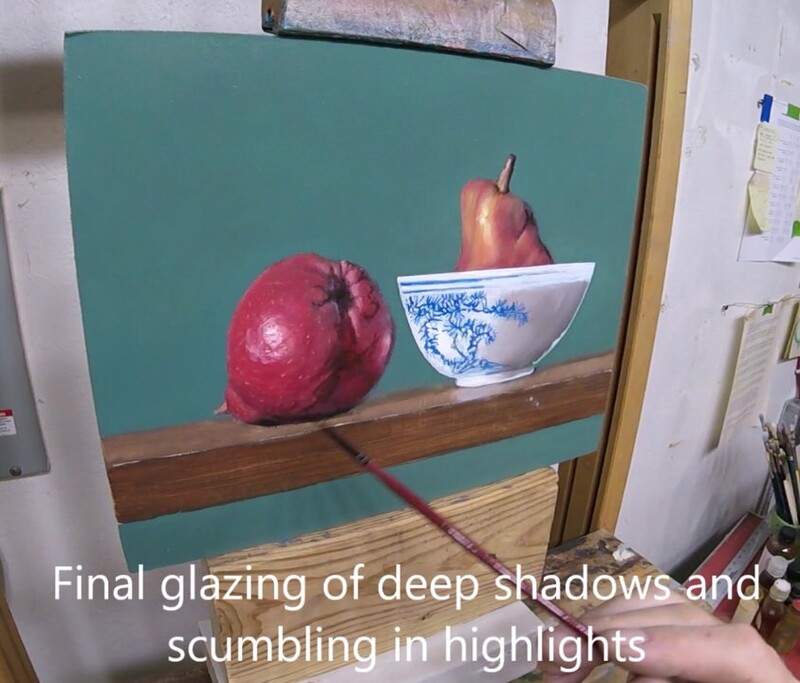 Indirect painting method. Here, you see my drawing, and the beginnings of the background. I have a deadline of but a few days, (am returning to my home studio and moving out of this gorgeous space that I've worked in for the last year). So I'm slapping paint with a putty knife. Quick work is made with the background then the shelf. This is still considered an underpainting as several more will follow. The main thing is to block in my main colors and basic forms. 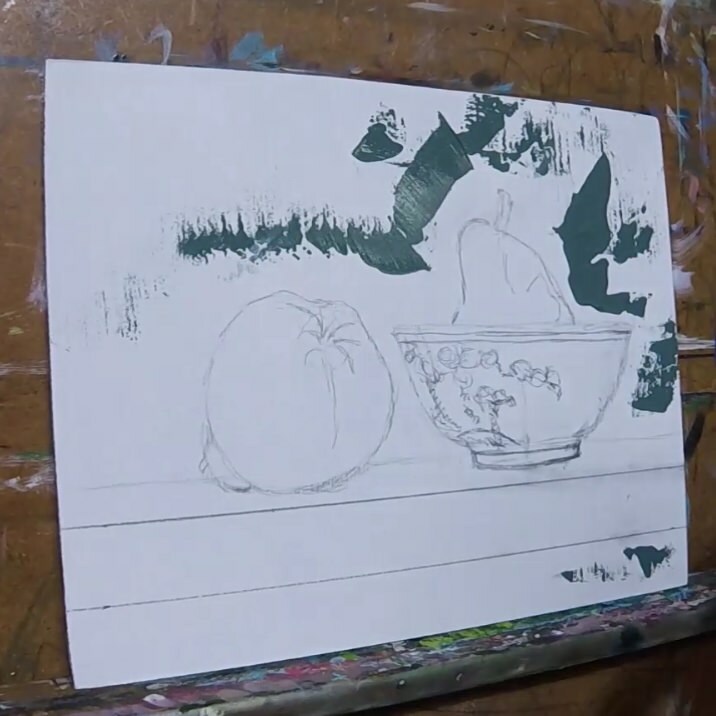 This pears painting demonstration is still concidered an indirect painting method, however, if you are able to achieve what you wish with a single pass, then great! There are some that can. You'll notice the extreme shine to the paint, almost like industrial enamel high gloss paint. It is due to a very thick medium that has been added. It is called Venetian Turpentine. Its not a turpentine at all, but it does have a wonderful fresh pine sap odor. It is made from a special tree sap and is very thick. I give the actual proportions later in the article. 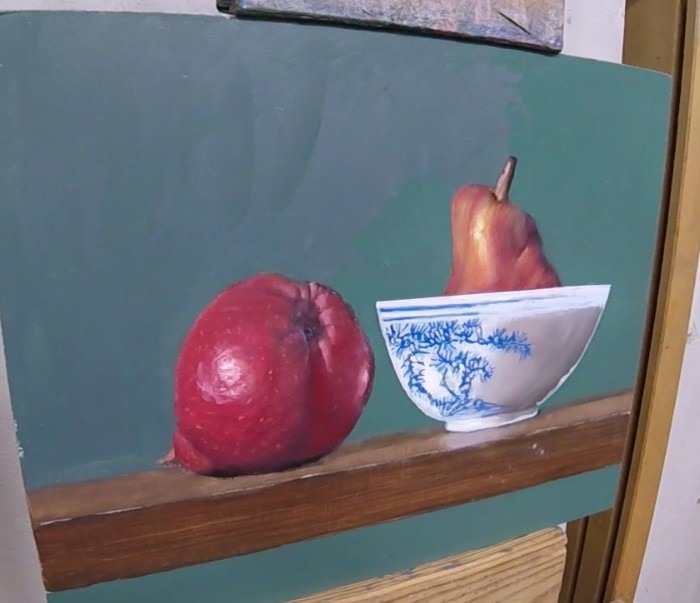 Below you see the pears colors blocked in. 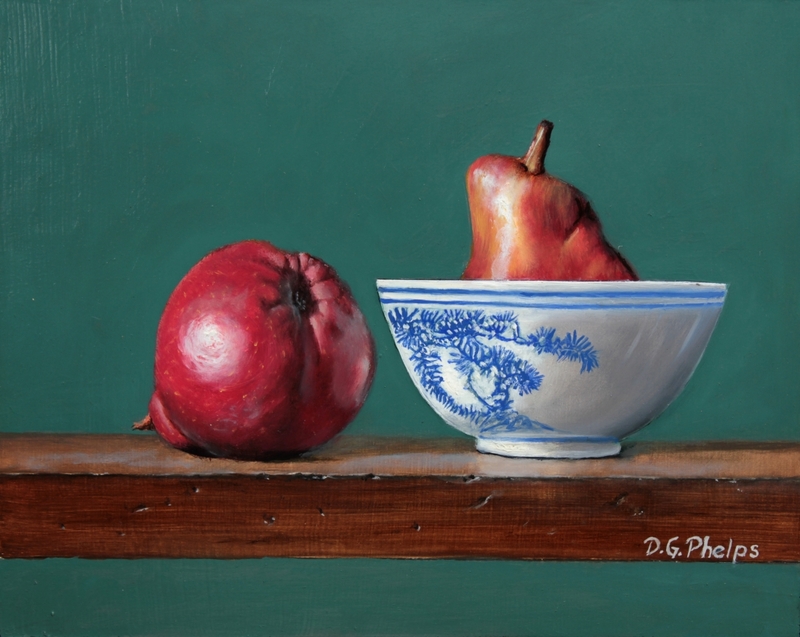 More Pears Painting Demonstration photos and a film. It is at this point I ran out of time, and had to commence with my move. But below, we pick right back up. I didn't like the blue gray background so I'm in the process here of adding a green glaze over it. I've also done some preliminary work to the bowl. 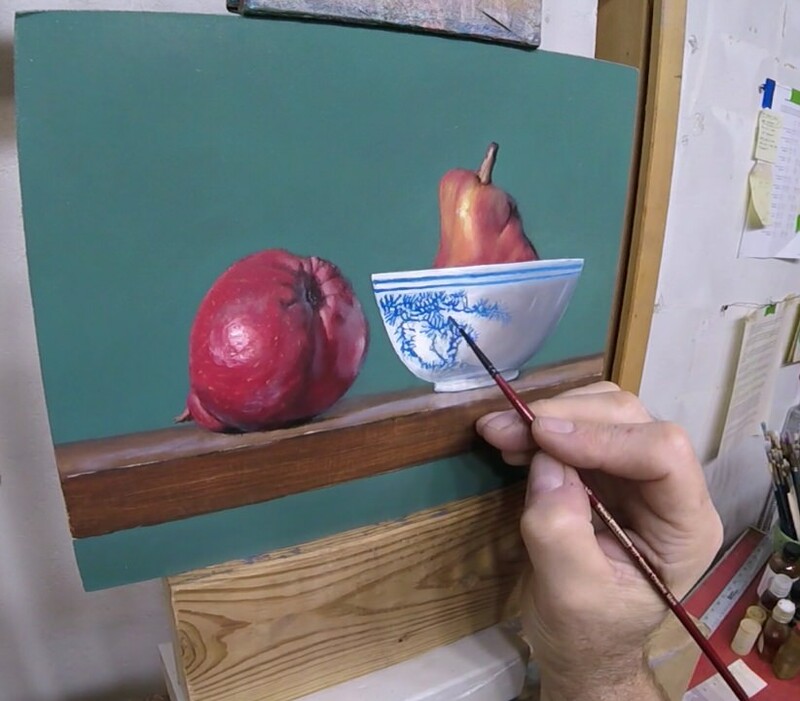 Here we have the final glazings being applied to the pear and around the entire work. Some additional work being done to the bowl, both in its blue design work, and shadowing. Some final details and texture being applied to the shelf. Did you enjoy, or learn something from this page? Why not create some good Karma, and pass it on? Face book like us, Pin the images you love, or Google + and let others feel the warmth! Here is the compressed video demonstration of the whole project. Enjoy! As the painting progressed, subsequent layers used less mineral spirits. I also used the medium as a couch to paint into. This was applied with a brush, and excess wiped off before paint was applied. This essentially is from an artist that has some really great videos. He however, doesn't paint in layers but rather, wet into wet. He explains his reasons on his site in detail. 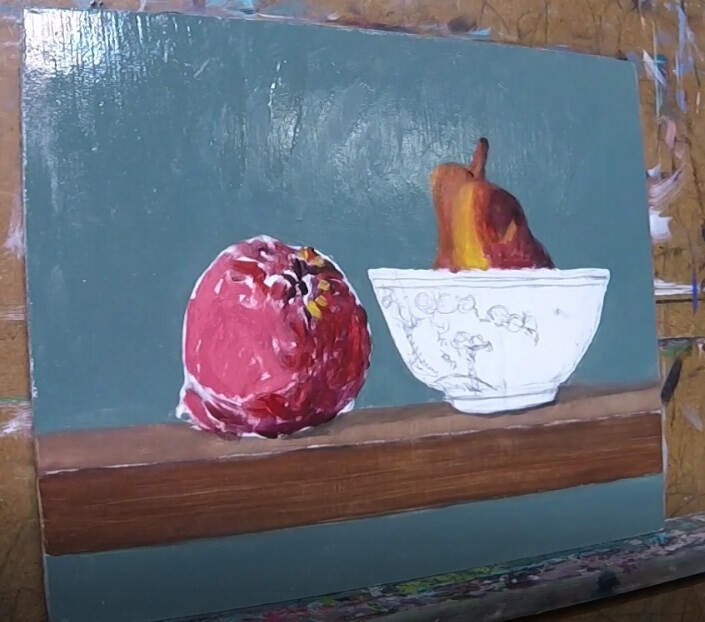 He's also taken a step further than most in getting Archivists to check his painting methods to make sure they are sound. His name is Mark Carder. Check out his supply list here. There is a link to a YouTube video on the page link above that shows you how he mixes his paints. He does add "oil of clove" that slows the drying process down considerably. 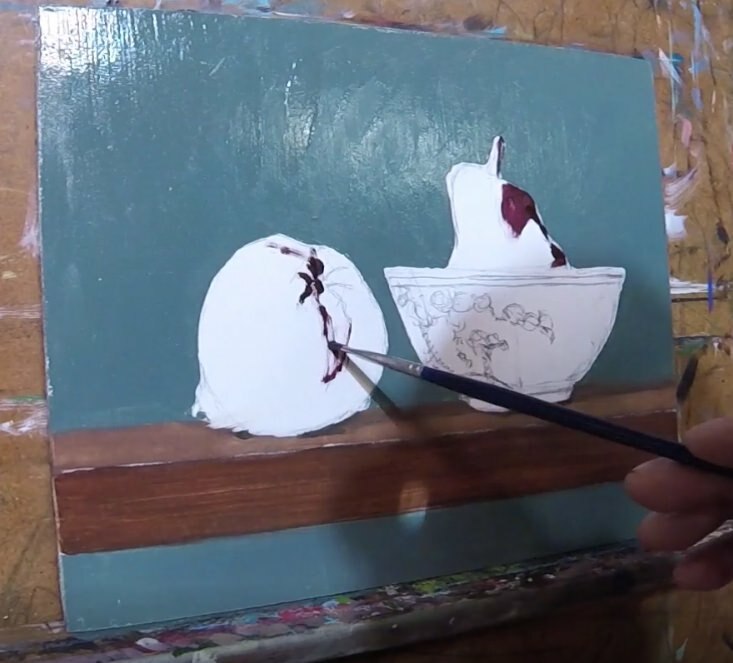 I however, in this pears painting demonstration, leave the clove oil out as I would rather have my paint layer dry so that I can come back into it the next day with glazing. I add just 2 drops of a Cobalt Dryer to my mixture that I'm going to use that day. Then toss out any leftover as it will be useless the next day in the mixing cup. 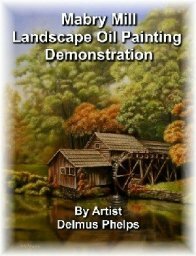 Again, I hope this is beneficial to you in your endeavours with oil painting!